In-depth exegesis from a renowned Hebrew scholar. This Eerdmans Critical Commentary volume is Shalom Paul's comprehensive, all-inclusive study of the oracles of an anonymous prophet known only as Second Isaiah who prophesied in the second half of the sixth century B.C.E. Paul examines Isaiah 40-66 through a close reading of the biblical text, offering thorough exegesis of the historical, linguistic, literary, and theological aspects of the prophet's writings. He also looks carefully at intertextual influences of earlier biblical and extrabiblical books, draws on the contributions of medieval Jewish commentators, and supports the contention that Second Isaiah should include chapters 55-66, thus eliminating the need to demarcate a Third Isaiah. "A work of massive erudition deftly wed to literary sensitivity. . . . An outstanding contribution not only to our appreciation for one poet's work but to our understanding of prophecy and the state of Israelite religion in the late sixth century." "Shalom Paul's commentary constitutes as rich a treatment of Second Isaiah as exists today. The work builds from a firm philological base to address with equal excellence the larger literary, historical, and theological issues central to the work of this crucial prophet at the turning point of ancient Judaism. Evidence is garnered from every corner of biblical studies -- Mesopotamia, Qumran, medieval Jewish commentators, modern researchers of every stripe, and more -- and is then digested in an exceedingly readable explication of the ancient text. This volume is destined to remain a valuable work for years to come, for both students and scholars alike." "A superb commentary. Not only does Shalom Paul bring to Isaiah 40-66 his great exegetical skill and all the resources of contemporary biblical scholarship, but he also brings a mastery of the important and often neglected insights of the pioneering medieval Hebrew grammarians and commentators, an acute sensitivity to the book's indebtedness and allusions to other parts of the Bible, and an unsurpassed knowledge of the ancient Near Eastern literary heritage and the culture of sixth-century BCE Babylonia in which the prophet and his audience lived." "Paul's sensitivity to the linguistic nuances of the prophet's sophisticated Hebrew and to the richness of his allusions is shared with readers in clear, accessible prose. The freshness of his original observations and insights makes this commentary an important milestone in scholarship on Isaiah 40-66 that will have a lasting influence on how the book is taught, preached, and understood." 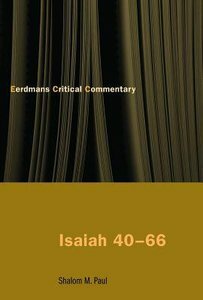 About "Isaiah 40-66 (Eerdmans Critical Commentary Series)"
This radically new, three-volume commentary by Urban von Wahlde on the Gospel and letters of John is the most detailed study of the composition of the Johannine literature ever put forth by an American scholar. Perhaps more than any other New Testament book, the Gospel of John has been read and used by Christians in every age, and for the greatest variety of purposes. Nearly all of the problems confronted by those who study John have to do with the literary strata of the Gospel of John and their relation to the composition of John's letters. Exhibiting an archaeologist's precision and engaging a whole range of scholarly contributions in this area, von Wahlde digs down to the foundations and exposes three distinct literary strata in the development of the Johannine tradition. This first and foundational volume gives detailed evidence identifying and listing the criteria for each stratum. Including the first-ever history of the development of Johannine theology, this commentary is a major breakthrough in the study of John's Gospel and his three letters.